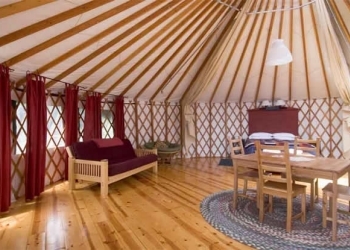 Treebones yurts are spacious and tastefully furnished including: plush queen-sized beds with linens and cozy comforters, a heat source, electric lighting and a hot & cold sink vanity. The yurt floors are polished pine wood with french doors that open to a generous redwood deck with spectacular coastal views. It's "nature with a little nurture". 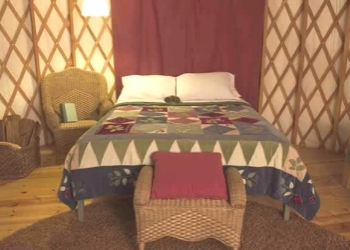 With our unique lodging, you have all the accessibility to nature of a tent with all the comforts of a cabin! You can sleep under the stars - just enjoy them through the sky dome from the comfort of your own bed. Treebones is the name affectionately coined for this wonderful place back in the '60's by Big Sur locals. This unusual triangular piece of land is surrounded by the Los Padres National Forest and the Pacific Ocean. It was then a crude recycling wood mill. A local character by the name of Patrick Cassidy leased the land and struck a deal with US Forestry whereby he was permitted to haul dead wood from the surrounding coastal mountains onto the site. Once on the land the wood was milled into usable lumber and sold.. The old sun-baked silvery tree-bones lying around conjured the name "Treebones" in the minds of those enjoying the local scene. Today, Treebones Resort tries to employ the concept of re-use & re-cycle . We are making attempts to recycle even when it is at great personal cost. On our site, the extremely hot heat exhaust created from our clean burning, energy-producing turbines is used to heat the pool, hot tub and radiant flooring in the lodge, restrooms and shower area. And there's more to come!